Carscoop has released an illustration that encapsulates what they believe will be the next generation 2014 Chevrolet Silverado, just weeks before the truck is officially revealed December 13. Is the surprise spoiled? It very well could be. The look both matches the sketch of the new Silverado from about a month ago and follows the contours of the vehicle as seen in spy photos. The design is modern and more bold than before, but there’s nothing too revolutionary to be found here. It’s still very boxy, while not coming across as obnoxious. Still, mysteries are what the cabin will eventually look like, if GM will apply a 3.6L turbocharged V6 engine, and if some sort of performance variant will be offered to combat the likes of the Ford F-150 SVT Raptor. Of course, in the shadows is the 2014 GMC Sierra, which is going to be just as new as the Silverado, yet nobody has gone and imagined what the new pickup will look like… yet. I was expecting a larger Chevy sign. Something huge actually, not this small little peanut of a Bowtie. I love it. GM just has a way to make design classy on pickups and not overdone like the Super Duty Ford or Rams and lets not forget the Tundra. If the interior is anything like the new Malibu it will ge pretty nice. I have owned 7 GM pickups over the years and think they should come talk with me for the next design. Definately better then current Silverado! I hope they’ll offer painted facia (grille/bumper) lots of guys now a days don’t like all that chrome. Richard, the reality is that the vast majority of truck buyers dont care about design/looks(many actually like this look, which looks dated to us), as long it looks decent, its fine. The F150 undeniably looks better than the Silverado, but for trucks, the inside matters much more than the outside. If they can put an powerful yet decent mpg Engine that beats the Ford ecoboost, and make the interior nice, their is no reason the Silverado would not be able to hold its own against the F150 in sales. For a drawing it looks great to me. I just can’t see the concerns that Mark M see’s ,from that same drawing,did i miss something? The “drawing” is fine. It’s the vehicle that the drawing is depicting that is woefully inadequate. If GM thinks it can duke it out with 150 and Ram with this garbage, it has another thing coming. It is 10 years old already and not a single one has hit the street as yet. Richard, we know nothing about the vehicles yet. How are they woefully inadequate and 10 years old already? I think it will have no problems selling against the Ford or Dodge. Last summer I drove from Seattle to the Twin Cities and saw so many more GM pickups then Ford or Dodge. And funny how few import pickups in Mt, ND, Mn. Of course we all have our own thoughts on good design. I myself love the interior on my 07 Silverado, was not a big fan of the bulge of the fenders but now I kind of like them. The article over at Carscoops.com says GM hopes this design will get the C/K to leapfrog the F-150 which outsells it every year. rendering is accurate, all they’ve done is slightly nudge it. to use some flair – and see what diesels they’ll be offering. If GM can momentarily catch Ford that would be great. I say momentarily because as we all know Ford has a new truck not too far off; and then there’s Toyota, which will no doubt come out swinging in the styling department (something GM is afraid to do anymore). But I wouldn’t read too much into this pic, Even if this picture is close, I’m still confident the real thing is going to look better. 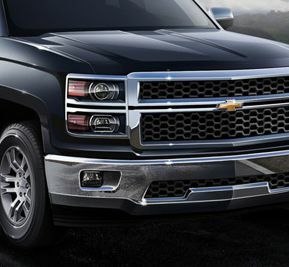 I have to agree, though GM has stated over a year ago that the appearance was going to be evolutioary in appearance, I’d expected that was going to be the case when the first proto types started to hit the streets late last year, we’ll just have to see how the Towing Numbers and the overall Horsepower ratings ties it all together for the Silverado, not bad from this photo, but in my opinion, the styling could have taken another big leap foward. And me in the market for a brand new diesel to replace my 2001 Duramax. Except why buy a Chevy if I can’t get it fixed? Do you think STYLING matters when there’s no shop around? I liked when I could walk to the nearby dealer that was closed. Now the only dealer (Barely) within 20 miles (Opened since the ‘Month of the long knives’ in 2010) “Doesn’t work on anything big.” That’s my excuse for not taking the transmission out in my driveway and fixing the clutch myself. A fairly easy job if you have the facility. Not a valid excuse for a Chevy dealer. (And you’re wasting time on ARTWORK?) They told me it has to go to the next county. My truck is still sitting in my driveway. These silly rerenderings are not what buyers are looking for, reliability really becomes a factor when it breaks down, GM is proving unreliable. “Modern and more bold. . . .” needs desperately to be applied in this caes to business practice, not artwork. Get me a dealer here in North Orange Country Ca., before I WALK to the nearby Ford dealer, only a block farther than the old Chevy dealer was. Hey jd, we are waiting for you! …really looking forward to seeing the real thing in person – even when they reveal official pics, sometimes seeing it in person makes a big difference. The biggest thing I see wrong with this “rendering” is the size of the Chevy logo – I’d bet money that Chevy is not going to put a puny logo like that on the grill, and that just makes the rendering even more of a tease knowing that it’s just someone’s opinion, so I’ll hold my judgement until the covers come off. The sketch linked in the 2nd paragraph actually looks nice, but it’s just another interpretation of what can be see through the covers. Like the front bumper so much better than the present one. Would love to see a sport version lowered,big power and a stick. looks like they dumped that ugly front bumper,I can only hope they they lost the shark fin over the drivers head.If that thing is needed for XM or Onstar please move it to the middle and paint it the body color. yes gm have a problem whit wheel design look the caddy it look cheap….maybe they need somebody whit new idea or maybe the problem is the same old man give the ok to build the ugly wheels..and gm dont screw this truck …i just waiting to the new design to get a pickup ..maybe y go to ford or dodge ,,,if you screw this truck..remember the gm all terrain design …this is hot.. The Chevy bowtie fits the grille divider and is tasteful. I personally don’t like the oversized emblems, they remind me of those gawdly wrestling buckles. Same with that ugly blast of chrome on the rear hatch of the Escalades… they’ve got to go. If it looked like a George Jetson truck a lot of the same people would say that it is over the top and they miss the good old days of square wheel wells. This truck looks great,the current Silverado looks great.An interior redesign and new engine line up is really all that was needed.All the other updrades the truck is getting are the bonuses that will put it on top of the truck market for a while.